Remarkable early French board game. Jeu Instructif des Peuples et Costumes des Quatre Parties du Monde et des Terres Australes. A scarce 1815 French geographically themed board game or jeux de l'oie (Game of Goose) produce by the French publishing house of Basset. In the spirit of snakes-and-ladders, the jeu de l'oie is a unicursal race game played with two dice and tokens. The present example consists of a voyage around the world, from China to France, in 63 squares, each representing different locations and cultures. The instructions for the game are located at the center of the spiral. 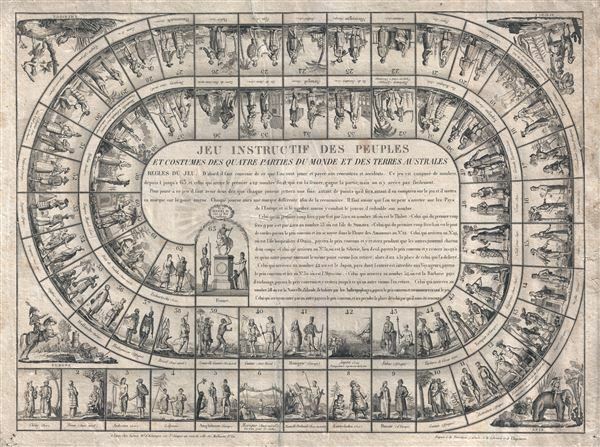 Such games were popular in France in the 18th and early 19th centuries with some 19 known variants, including the present example. 6. Traditionally a bridge, here represented by Mexico or Central America. Advance to square 12. 19. Traditionally an inn or hotel, here represented by the hospitable peoples of Tahiti. Wait 2 turns. 31. Traditionally a well, here represented by Siberia, a place of exile for Russians. Wait until another reaches this point and exchange places. 42. Traditionally a maze, here represented by Japan were navigators are refused entry. Return to square 39. 52. Traditionally a prison, here represented by enslavement on the Barbary Coast. Wait until another reaches this point and exchange places. 58. Traditionally death, here represented by being captured and eaten by the anthropophagi of New Zealand. Return to square 1. Mexico (Central America) View the rope bridge. André Basset (or Bassett) (fl. 1768 - 1784) was a well-known French family of publishers and engravers active on the Rue St. Jacques, Paris, during the 18th and 19th centuries. Basset was best known for the production of low cost optical views of European cities and events. However, the firm also produced games, maps, and other prints. The firm was taken over by Paul-André Bassett in 1784.Paul-André Bassett himself retired in 1819, but the business continued under various family members until 1865. The firm operated from the corner of Rue St Jacques and Rue des Mathurins, Paris. Good condition. Some soling and creasing. Minor verso repair of split.